But my all time favourite thing I can do with the heat tool is cut stencils!!! 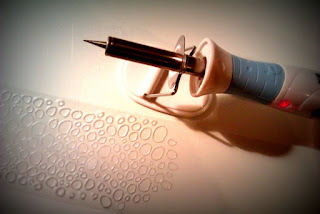 I use acetate/transparency film to make my stencils. I would normally use a craft knife to cut the design out but after a short while it would hurt my finger, using this heat heat tool it makes it so much easier and I can't believe how much quicker it is too. I am so pleased with it. I am sure I will find other uses for it!